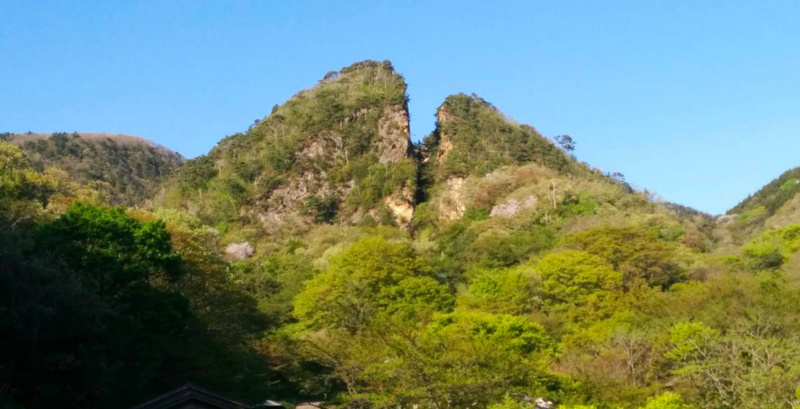 Duelling Peaks is one of The Legend of Zelda: Breath of the Wild's most notable landmarks, and it would appear that it was inspired by a real mountain in Japan. The mountain is split down the middle just like the one in the video game and is found on Sado island, located off the west coast of Japan. 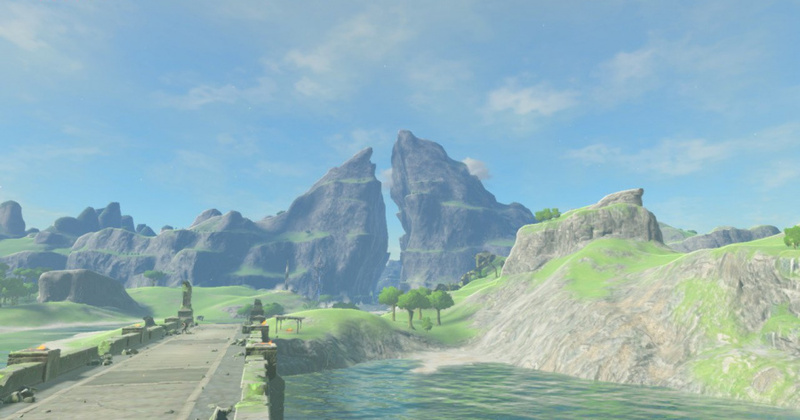 While we don't know for sure, it would seem that someone on the Breath of the Wild design team has visited Sado previously. What do you think? Are there more locations in the game which have real-world equivalents? Let us know if there are any that stick out in your mind. Did two dragons break them apart as well... cause dragon meat is mighty tasty. I wonder how many star fragments you can view falling from that location. Meh... it's somewhat similar, but the proportions and heights don't match and the real mountain isn't split all the way through, so I'd sooner say it's loosely based upon, but definitely not a case of "they put that mountain in Zelda Breath of the Wild". Eiji Aunoma, please use Indonesia landscape as next Nintendo project. Me as Indonesian people will so proud to see Indonesian landscape such as Lombok beach / Tanah Lot Bali / Borobudur temple, etc appear as Cameo inside Nintendo games. Maybe there's a reason I look around for shrines and want to paraglide off cliffs after I play. I got such a kick out of climbing to the top of the tallest one of those peaks (in-game). It wasn't too long after leaving the plateau, I had just a mini-downer walking along the river towards them, cos for a brief second or two the game seemed 'samey'. But then I started exploring those two peaks and it totally sealed the deal for me. Now we need one that looks like Cookie-bite Mountain. Man, I bet Sato Island is just -covered- in Korok seeds. Which is a little gross. @GrailUK I actually am, but only with women. Where other topics are concerned, I'm mostly a realist. When I first saw the picture, I immediately thought that the only similarity is that it's also split down the middle, but other than that, it's a stretch in my opinion to say that the mountain has been put in the game. I want to climb it and then jump off holding a sheet over my head. 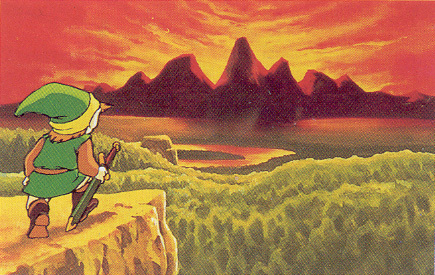 I thought Duelling Peaks in BotW came from some original Zelda famicom artwork? Whether that came from this, who knows. EDIT: I think I'm mistaken, I was thinking of this artwork, which doesn't really look like the duelling peaks. I'm still sure there was an article about it though. I must be getting old. Off Topic. It appears the PC Race is loving the Switch. Read several comments saying the best combo for gaming was a PC Switch. Unsurprising. In the 'making BOTW' shorts they even mention using Japan as a size reference to the world map. I bet there are plenty of things like this in the game. @ThanosReXXX I never said it was definitely based on it, did I? "It looks like..." isn't exactly a definitive statement. @GravyThief No, you aren't senile just yet. They definitely referred to this piccy as an inspiration for the game and specifically Duelling Peaks. I'm thinking they mean Sado island...I'm not aware of any other islands than Sado that sit off the west coast of Japan. If it is Sado they mean...that's awesome because I lived there for a while and it totally seems like a place in BotW! The memories! @Damo There's no reason for you to take this personally, since I was never implying that you said that, but the guy that took the photo and says it has a striking similarity to the actual mountain definitely seems to be reaching a bit. Similar types of rock formations can be found all over the world. @gcunit I've seen your avatar for a couple of months, never really dwelled on it and I got up to that location at least a fortnight ago but your comment has just reminded me of it. Got up there without Revali's Gale, it was quite a climb and certainly one of if not the most memorable Korok seed locations. It has to be that point, I did the same thing, I think everyone who's got there has done it, spiralled around the top and took in the majesty of the view. Edit: 1 thing, you can't mark locations on the map. Spotted a shooting star at the end and wanted to speed travel to its location but I had no marker. I remember Exo Force (A lego set) also having a split mountain. Who knows where the creators got the idea from. They wouldn't necessarily have to visit this mountain to come up with the idea. @ThanosReXXX I've noticed with him he takes a lot of things personally, defends things with bad arguments, and never admits to be wrong. Great qualities for a journalist, no? @ThanosReXXX I thought @Damo's response was just a little bit spiky myself! Thar be Guardians near them peaks, travel cautiously. Stick to high ground and tall grass. It's not uncommon for development staff to go on location for inspiration, especially in Japan. If there's that place in Japan with a peculiar mountain that looks just like the one in the game, there's a good chance there was some inspiration there. Or maybe someone on the map design team actually comes from the area, or went there for a summer vacation or whatnot, or saw it in a TV programme and thought it was neat, there's so many ways that this could have inspired them. @RedMageLanakyn You noticed that too? I really used to take it personally and think it was just me, being a cranky old New Yorker I am a bit much to deal with, so I try to avoid him as much as possible for his sake as I don't want to rub anyone the wrong way, but I did finally decide it's not me he has a problem w/, it's criticism, real or otherwise. So it goes. I do think he has a problem w/ @ThanosReXXX though from back in the NX days. Could be my fault, guilt by association. @rjejr It's not just you, he clearly has a complex. Part of me thinks it has something to do with his profile pic, maybe it makes him feel untouchable or infallible. @Anti-Matter I think there's a lot of games actually draw on Indonesian landscape, particularly the ancient ruins & temples. It lends itself well to being a kind of exotic environment. Even in BotW, there's an area in the Faron region that I'd say you might find at least loosely familiar in terms of its inspiration. @Dangerous25 @RedMageLanakyn Yeah, it was a bit testy, but in some ways, I can understand. He made the article, so criticizing it could be taken as a personal thing, even though he is only the messenger of the original story. Imagine yourself posting an article and being happy with it and then along comes some anonymous guy questioning the information. Depending on the situation, that might annoy me too, hence the reason of me explaining to him that it wasn't intended as personal criticism. Or wait: was it the criticism of the EuroGamer article back then? We were far from the only ones with that. @ThanosReXXX I liked your reply, it was very reasonable. I just thought his was a teeny bit touchy, reading over your original comment, it was pretty harmless. But anyway, I love the team here, including @Damo, really just thought it was unnecessary but you took it very well which I'm sure he appreciates. If I wrote an article in which I pretty much directly copied from another source, i wouldn't be upset at all if the information was questioned, because it's wasn't mine to begin with. The headline and his couple paragraphs certainly seem to me like he believes it's true, so if anything he's upset because you agree with his opinion, and tried backing out by saying he didn't directly say it was verified. @ThanosReXXX "was it the criticism of the EuroGamer article"
I don't know if it was one particular thing, the whole NL website was turning into a red state - blue state US mess over the AMD vs dock vs home vs everything. I still blame Ntinedo for being so secretive, it was like 18 months of Reggie saying " We aren't talking about the NX today, but I just wanted to remind you that the NX was a thing we aren't' talking about, so dont' ask me any questions about the NX, which is a thing, but we're not talking about it." And he kept saying that over and over for 18 months. Drove us all nuts. Some of us got over it, some didn't, I distanced myself. @ThanosReXXX You've hit the nail on the head to be honest - even though this wasn't an original story for Nlife but something sourced elsewhere, it's only natural that writers get a little bit invested in their work. Maybe I read your comment wrong but it felt like it was needlessly pointing out the obvious - this isn't the "definitive" account how the inspiration behind Duelling Peaks, but a fun observation. Sorry if I came across as a little sharp, but you can imagine how many comments we get along the same lines on a daily basis. All part of the job. @RedMageLanakyn Made, posted, quoted... whatever. All semantics far as I am concerned. He did dedicate an article to it here, and my main point was that I tried to look at it from his side, regardless of how much or how little trouble he put into the article. @rjejr I have no issue with criticism - as long as it's valid. Funny you should mention the NX thing, because the amount of tongue-biting we had to do after covering that Eurogamer story (and verifying it with Nvidia off the record) and then seeing the response on here (and other sites) was insane. @SLIGEACH_EIRE I obviously know the avatar, but don't know what you're referring to. In my version of the game there is no pole to spin round at that location. I've still not found that pole. I haven't actually played any BotW for about a fortnight - other commitments and then Mario Kart have kaiboshed it, I'm still only on 65 hours. I do miss it though. @RedMageLanakyn No it predates the pic by a year at least. I think he's only had that pic for maybe 2 years. This article he wrote, in which I think we as a community broke him, is 3 1/2 years old. I though I got along w/ him fine before that but never again after this article. Could have been me, I'm a nut case. 523 comments but I was #14 + #90 among others - I was on here WAY TOO MUCH back then - but I guarantee it's the most replies he ever wrote in 1 article. Most people did agree w/ him, but I think it soured him on community interaction. Well at least w/ me. @rjejr Wow, I think you might be reading too much into that. I'd totally forgotten that piece even existed. "Soured community interaction"? I've been interacting with the members of this site just fine since then, no complaints here! @MattFox Agreed. I mostly play on PC but I've always had whatever machine plays Nintendo games as a close second. I have a PS4 for the few exclusives but any game that's multiconsole I always go with the PC version for obvious reasons — but the Switch could be the first console to change that. The ease of portability would make a strong argument. That and the desire to support Nintendo 3rd party releases. @Damo Yeah, seemed kind of unfair to those of us who were guessing about what Ntinedo might do while you had already held the thing in your own 2 hands, or personally knew someone who did, but you never just came out and said - "Stop guessing guys, we KNOW what it is." - you just kept telling us your guesses were better than our guesses b/c you were smarter than us and able to deduce things better than we were. (No, you never said that of course, but it was implied.) I know your hands were tied by NDA's and all that, and that's the way life works, but it still seemed unfair. Easy to always be right when you KNOW rather than just trying to figure things out. And then when the news finally did come out, you kind of got up on your high horse about being right, even though you never had to guess, you actually knew. You did come clean after that, you knew all along, but it was a tough 2 years for everyone. Anyway, that's how it looked on this end, I'm sure your version of history is a lot different. There simply was more readily available info that pointed towards something to do with either AMD and/or DMP, so even in hindsight, it still wasn't all that strange that so many people did not believe the EuroGamer article. And they also had kind of a bad track record with Nintendo, like with how "sure" they were on what chipset was going to power the 3DS, which they later flat out denied because they wrote some cover up article, pretending that their older, completely faulty article didn't exist. If we would have had the info that you guys had, then of course it would be easy for us to believe in the story, but we didn't, so we had to make do with what WAS available, and theorize/speculate from there. Most of the time, it's exactly that which makes them so brilliant and entertaining as a brand. @Agent721 instead of playing games, I know. The shrines and talus' were interesting for a second, but the Dueling Peaks is a very forgettable location. There's practically nothing there. I think it's a valid assumption, the game being developed by a Japanese develepor and all. And of course, it isn't the mountain exactly as far as its geography. But it wouldn't be the first time a location or part of a game was directly inspired by something real, with its own twist added to it. 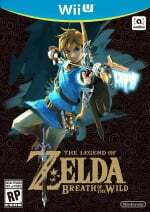 @rjejr @ThanosReXXX @RedMageLanakyn @Damo Seriously, of all the articles that have been posted in the past month, contentious headlines, some I'd argue are even trollish, misleading, or click-baity, and divisive topics about Nintendo, games, or some such, how on earth did you guys all manage to pick an article about a picture of a mountain somewhere in Japan that looks like Dueling Peaks to start a giant argument over? Good grief! @NEStalgia I did notice that earlier, that we were having this discussion in the least argumentative of all articles. I decided it was happening here for exactly that reason, b/c there really isn't anything to fight about, and people could simply talk w/o everything falling apart. Of course I could be saying that too soon as I have a bunch of replies in my in-box I haven't read yet, yours was on top and I'm working my way down. Or not, I have a few other matters to attend to first, then cook dinner. I used to enjoy having healthy debates, I don't know what happened. Time I guess. Nobody should spend 10 years on a website unless they work there. @Damo Well that's good to read. @NEStalgia The MK8D article probably would have been fine, but either the Unreal 4 engine or 1 Joy Con playing ARMS articles was going to lead to disaster. Can you play an Unreal engine 4 game w/ 1 Joy-Con I wonder? I think I like Joy-Con better w/ the - then without. 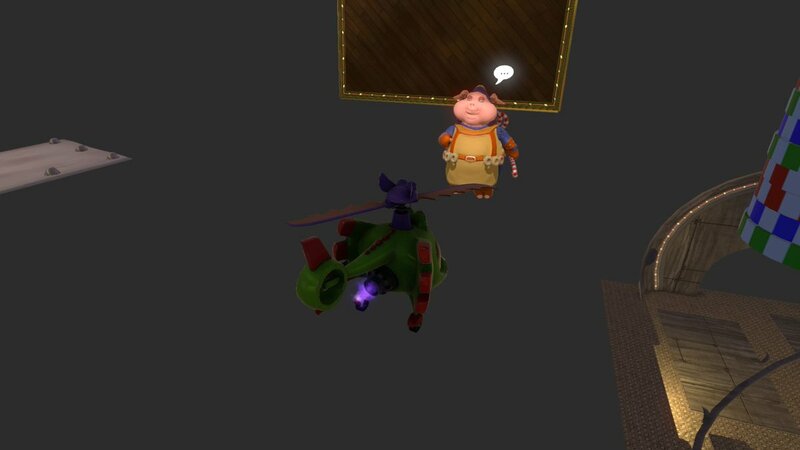 Does here seem like a good place for my Yooka-Laylee glitch photos to you? Played this way for an hour last night. @rjejr Well at least you've admitted it's a problem and have taken steps to ease away from it! I need to scale Sado Peak right away! @Dangerous25 - What's your favorite MJ album? Dangerous? I'd probably go with Bad personally, but I think most people would say Thriller. There's a Korok on top of it! Doesn't Godzilla live under that one? 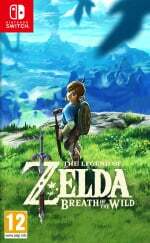 Didn't Nintendo claim that mountain was based on artwork for the original Legend of Zelda? That artwork still in turn could have been inspired by the mountain in Japan, but it could also just be coincidence. A mountain split down the middle would not be the hardest thing to come up with on one's own, after all. @Sean161 I mean PC gamers are choosing the Switch as their only/main console of choise. Many of them said they thought they'd never touch a nintendo console again, but are really glad they bought the Switch. @gcunit Isn't that the top of Temple of time? I've just played like 30 hours so I might be wrong. @NEStalgia @ThanosReXXX What @DAMO has insecurity issues? I haven't been on this site for long. So @rjejr is the grumpy old man. and DAMO is the insecure person. Seems like a perfect combination for some entertaining comments. Just explain yourself, and your misunderstandings, and move on, no reason for anger rage. If anyone considers this a real angry argument, it was the weakest argument I ever seen. That mountain looks nothing like in BOTW, the crack is smaller, DAMO you failed! You failed to meet ThanosReXXX BOTW mountain expectations. He's now fussy, how do you live with yourself? Actually the Satoru Mountain (or whatever it's called) looks more like that real one. @bimmy-lee HIStory! I became a fan around '92, my brother saw him on the Dangerous World Tour, so the HIStory era is the first I experienced properly as a fan. That album was his no holds barred response to the events of '93 which the fans went through with him & I think it's incredible, genius. @MattFox I agree with you that people on the PC side are getting Switches as it compliments the PC. Two of my friends who I play Overwatch with on PC just recently got Switches. I personally have been only PC/Nintendo since the Wii U and will continue that way with the Switch. The Wii U offered a great alternative to my PC gaming, especially since I have a young family and a Nintendo loving wife. Having said that, I also think we will see Xbox and PS4 owners who will see the Switch as a second console. Well, I hope that anyway. @CosmicLight I'm fussy? Never was an angry argument to me either, which I've already explained several times now. There is a mountain similar to dueling Peaks in the game that looks more like this real life location. Did anybody else notice that the mountain with the big hole in the side (I can't remember the name of it) resembles the mountain that piccolo accidentally blew up in his and Goku's fight with Raditz in DBZ when Piccolo fires his first Special Beam Canon at Raditz and missed? @senshu Satori Mountain. Yes, it looks exactly like that one, much more than Duelling Peaks.